This article is about the government complex in Albany, New York. For the shopping mall in Allentown, Pennsylvania, see South Mall. The Governor Nelson A. Rockefeller Empire State Plaza (known commonly as the Empire State Plaza, and also as the South Mall) is a complex of several state government buildings in downtown Albany, New York. The complex was built between 1965 and 1976 at an estimated total cost of $2 billion. It houses several departments of the New York State administration and is integrated with the New York State Capitol, completed in 1899, which houses the state legislature. Among the offices at the plaza are the Department of Health and the Biggs Laboratory of the Wadsworth Center. The Empire State Art Collection, a major public collection of 1960s and 1970s monumental abstract artworks, is on permanent display throughout the site. The New York State Office of General Services maintains the plaza. The Nelson A. Rockefeller Empire State Plaza Performing Arts Center Corporation is a New York state public-benefit corporation that was created in 1979 to manage the performing arts facility in the plaza. The plaza was the idea of Governor Nelson Rockefeller, who was inspired to create the new government complex after Princess Juliana of the Netherlands visited Albany for a celebration of the area's Dutch history. Riding with the princess through a section of the city known colloquially as "the Gut", Rockefeller was embarrassed. He later said, "there's no question that the city did not look as I think the Princess thought it was going to". Rockefeller conceived the basic design of the complex with architect Wallace Harrison in flight aboard the governor's private plane. Rockefeller doodled his ideas in pen on the back of a postcard, and Harrison revised them. They used the vast scope and style of Brasilia, Versailles and Chandigarh as models. The massive scale was designed to be appreciated from across the Hudson River, as the dominant feature of the Albany skyline. Paying for the construction of the plaza was a major problem, since a bond issue for an Albany project would almost certainly have been disapproved by the statewide electorate. Despite the displacement of thousands of loyal political voters, Albany Mayor Erastus Corning worked with Rockefeller to engineer a funding scheme that used Albany County bonds instead of state bonds. During repayment, the state guaranteed the principal and interest payments in the form of rent for a plaza that was officially county property. Ownership was then to be transferred to the state in exchange for regular payments in lieu of taxes. Control of the bond issues gave Corning and party boss Daniel P. O'Connell influence when dealing with the Republican governor. The bonds were paid in 2001 and the state assumed ownership, though it required years to do the paperwork to change title. The state obtained possession of the 98.5-acre site on March 27, 1962 through eminent domain. Demolition of the 1,200 structures began in the fall of 1962 and continued through the end of 1964. The official groundbreaking was on June 21, 1965. The initial cost estimate was $250 million. The project was plagued by delays. Unrealistic schedules set by the state forced contractors for various parts to interfere with each other during work. The difficult working conditions caused some of the contractors to successfully sue the state later. The first building to be completed was the Legislative Office Building in 1972, and the last was the Egg in 1978. Though the plaza was dedicated in 1973, it finally began full operation in 1976 at a total cost exceeding $1.7 billion. As of 2014[update], more than 11,000 state employees work at the complex. 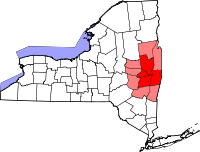 When the State of New York seized the area in March 1962, it was home to about 7,000 residents according to the 1960 US Census. Like urban cores in most other American cities in the Northeast and Midwest, downtown Albany had seen sharp declines in white population, downtown retail activity, and hotel occupancy rates since World War II. At the same time, the African American population had doubled in the downtown census tracts between 1950 and 1960. At the time of the State's 1962 seizure, the largest ethnic group in the entire area was African American, at about 14% of the total population. First and second generation Italian Americans made up about 10% of the area's population. The 98-acre area was made up of several distinct neighborhoods. To the south, clustered around Madison and Grand streets was the heart of Albany's Italian American community. Although only about half of Little Italy was seized by the State, the demolition and subsequent noise and dirt associated with the construction of the Empire State Plaza led many residents to move, even if their homes were not appropriated. To the north lay Albany's rooming house district, centered on Jay, Lancaster, and Hudson streets between Eagle and S. Swan. About 10% of the buildings torn down for the Empire State Plaza were rooming houses. In them lived over 1,000 single men, often elderly and poor. They made up about one third of all households and at least 15% of the take area's population. The eastern part of the take area, where the South Mall Arterial is now, was Albany's "Gut", an area of cheap hotels, flophouses, and dive bars. The take area also boasted elegant homes, particularly on State Street at the northern end and Elm Street below Madison. The area in and around the seized area had long been home to immigrants and their churches. Five churches operated in the area in the years just before its seizure by the state. Holy Cross, a German national Catholic church founded in 1850, was at the corner of Hamilton and Philip streets. Due to declining numbers, it relocated in 1959 to Western and Brevator on the city's western fringe. Assumption of the Blessed Virgin Mary, a French national Catholic church, was at 109 Hamilton, between Grand and Fulton streets. Like Holy Cross, the church had seen a drop in parishioners to the point that in 1961 it celebrated only four baptisms and one marriage. Assumption relocated to the northern suburb of Loudonville. First Methodist Church, dating back to the 18th century, stood on the corner of Hudson and Philip streets. After the State demolished the church, its congregants decided to merge with Trinity Methodist on Lark and Lancaster Streets, rather than try to start up again in a new location. St. Sophia Greek Orthodox Church at 8 Lancaster Street was the heart of the Greek-American community, and was in the midst of a major expansion campaign when the state seized the area. It relocated to Whitehall Road on Albany's fringe. A bit further west stood St. Paul's Episcopal Church at 78 Lancaster Street. Founded in 1827, it moved to the Lancaster Street location in 1862. The Lancaster church boasted several Tiffany stained glass windows, attesting to the former wealth of the area. It relocated to Hackett Blvd. in 1965. Just outside the area seized by the State stood three churches. St. Anthony, on the corner of Madison and Grand (the building now houses Grand Street Community Arts), was the largest and most vibrant of the three nearby Catholic national churches. Just a few blocks west, at the corner of Madison and Eagle stands the Catholic Cathedral of the Immaculate Conception. The predominantly black Wilborn Temple was growing along with the African American population of the area. In 1957 it relocated from 79 Hamilton Street, within the area seized by the State in 1962, to the former Beth Emeth synagogue on S. Swan between Lancaster and Jay. The Empire State Plaza consists of various steel and reinforced concrete buildings, all clad in imported stone (except The Egg, which fully exposes its concrete structure). The buildings are placed on a six-story stone-clad Main Platform, supported by more than 25,000 steel pilings driven an average of 70 feet (21 m) into soft glacial clay deposits underlying the site. The placement of starkly abstract geometric building forms on a monolithic plaza is said to represent Rockefeller's concept of architecture as similar to sculpture. The exterior columns and narrow windows of the buildings resemble the style of the former World Trade Center towers in New York City, which were completed around the same time. The scale of the buildings in the plaza is imposing, and the complex is the most easily recognizable aspect of the Albany skyline. The Corning Tower is the tallest building in New York State outside of New York City; the Swan Street Building is more than a quarter of a mile long (400 meters), and modeled partly on Pharaoh Hatshepsut's Temple at Deir el-Bahri, Egypt. The Main Platform of the plaza itself is one of the largest buildings in the world. The complex incorporates 240,000,000 cubic feet (6,800,000 m3) of concrete, clad with 600,000 cubic feet (17,000 m3) of stone imported from many locations on three continents. A detailed walking tour guide can be downloaded, describing the many varieties of stone and concrete used in construction. At least 15 memorials are on the plaza, including the New York State Fallen Firefighters Memorial as well as memorials for World War II and the Vietnam War. The plaza has shade trees on the edges, and in the side gardens and memorials. Originally, hundreds of Norway maples were planted; today, they have been classified as invasive plant species by the State of New York. Crossing under the plaza is the South Mall Arterial, a short highway artery connecting to the Dunn Memorial Bridge. Construction of this highway destroyed many buildings of Albany's downtown. In the initial proposal, the highway was to go from Interstate 90 in North Greenbush (current exit 8 to NY Route 43), through Rensselaer, under the plaza, and connecting to the also-cancelled Mid-Crosstown Arterial, which would have extended from I-90 Exit 6, through the city, traveling underneath Washington Park, meeting with the South Mall Expressway in the process, and continuing on to the New York State Thruway at Exit 23. The current South Mall Arterial ends abruptly in a loop at Swan Street, with both eastbound and westbound lanes using the two outer portals of the four-portal tunnel leading under the plaza. (The inner two were to be express lanes to the Mid-Crosstown Arterial/SME interchange underneath the park.) The only evidence of the original Mid-Crosstown Arterial is the four level stack interchange for I-90 at present day US 9. Over 3,000 parking spaces take up much of the lower levels of the Main Platform. There are several CDTA bus routes serving the plaza complex, including some with direct access to a bus station in the underground Concourse. The buildings are set around a row of three reflecting pools. On the west side are the four 23-story, 310-foot (94 m) Agency towers. On the east side is the Egg (Meeting Center) and the 44-floor (589-foot (180 m)) Erastus Corning Tower, which has an observation deck on the 42nd floor. On the south end is the Cultural Education Center, set on a higher platform; and on the north end is the New York State Capitol. While the Capitol predates the plaza, it is connected to the Concourse by an escalator which allows underground access to the rest of the plaza, most notably (to the New York State Legislature, at least), the Legislative Office Building. The plaza is connected to the Times Union Center (a covered sports arena, known formerly as the Pepsi Arena, and originally named the Knickerbocker Arena) by a pedestrian bridge and to the New York State Capitol by an underground tunnel. Additionally a tunnel that runs under the West Capitol Park connects the Capitol building with the Alfred E. Smith Building at 80 South Swan Street. The entire complex is wheelchair-accessible, except the State Street Capitol entrance and the Concourse tunnel to the Swan Street Building. An access map is available onsite or is downloadable. In May 2017, New York Gov. Andrew Cuomo's administration announced the state would later in the year begin construction on a new microgrid that would provide power to the Empire State Plaza. The new microgrid project is expected to produce 90% of the complex's yearly electric energy needs. The Cuomo administration said the project should save the state $2.7 million in annual energy costs and cut down on greenhouse emissions. The project will use natural gas-fired turbine generators; however, Cuomo has been known to block new pipeline projects that would transport such natural gas. His blocking of those projects has become known as "The Wall of Cuomo". In the spring of 2017, for example, he stopped the Northern Access pipeline and did the same in 2016 to the Constitution pipeline. ISO New England has said being able to access enough natural gas for natural-gas generators for the six states that comprise the Northeast region of the US is a "pressing challenge", according to its 2017 Regional Electricity Outlook Report. ISO New England operates the power system for much of New England. The Concourse is Albany's "Underground City" with food courts, a McDonald's restaurant, banks, a post office, a CDTA bus station, a visitor's center, and several retailers. The Concourse connects all buildings of the state plaza, and many state workers spend their lunch hour there. The Concourse also features various works of art and sculptures, part of the State collection of modern abstract art. Free guided tours for groups or individuals are available by appointment, and self-guided Acoustiguide tours are also available. The Empire State Plaza has at least 15 memorials of various types, built by the New York State Office of General Services. State memorials to World War II, the Korean War, and the Vietnam War are here, as well as special memorials to women veterans, police, firefighters, crime victims, children, and missing persons. An illustrated and annotated self-guided tour brochure is available for download. Located on the 42nd floor of the 44-story Erastus Corning Tower, the observation deck is free and open to the public on weekdays. However, it does not feature a 360-degree view because it has no windows on the west side. The tower is the tallest building in New York State outside of New York City. The complex was the subject of significant controversy around the time of its construction. About 7,000 people were evicted under eminent domain, mostly from working-class and poorer sections of older Albany. The construction of the plaza occurred during the decline of Albany's downtown shopping district, and the massive displacement of population allegedly hastened the process. Numerous restaurants, specialty shops, two major department stores, and downtown's last movie theater had shuttered by the end of construction. The majority of the displaced residents had not owned cars, and they had shopped locally. The construction of the elevated plaza separated the largely residential neighborhoods surrounding Washington Park and points west, from the largely commercial streets between the State Capitol and the Hudson River. The plaza has also been criticized for the cost of its lavish architecture (marble and other imported stone are used throughout), its sheer size, and its period architecture. In a sharply critical 1976 New York Times article, architectural reviewer Paul Goldberger described the complex as "a compendium of clichés of modern architecture". He further commented that "Ultimately, of course, one realizes that the entire mall complex is not so much a vision of the future as of the past. The ideas here were dead before they left the drawing board, and every design decision, from the space allocations to the overall concept, emerges from an outdated notion of what modern architecture, not to mention modern government, should stand for." In his 1980 book, The Shock of the New, Robert Hughes refers to the buildings as being in "The International Power Style of the Fifties", comparing the buildings to those built by Fascist governments (Fascist architecture). Architecture critic Martin Filler, quoted in The Making Of Empire State Plaza, says "There is no relationship at all between buildings and site, neither at grade nor atop the podium, since all vestiges of the existing site have been so totally obliterated. Thus, as one stands on the Plaza itself, there is an eerie feeling of detachment. The Mall buildings loom menacingly, like aliens from another galaxy set down on this marble landing strip." Empire State Plaza viewed from the Dunn Memorial Bridge. The upper rim of The Egg can be seen at center-right behind the pyramid-topped KeyBank office building. ^ Churchill, Chris (17 November 2009). "Empire State Plaza price tag: $2 billion". Times Union. ^ a b Paul Grondahl (February 9, 2004). "Closing the Books on Billion-Dollar Deal". p. B1. Archived from the original on February 21, 2013. Retrieved 2010-05-06. ^ a b Weisman, Steven R. (1976-06-24). "Albany Mall Is Enjoyed by Friend and Foe Alike". The New York Times. ^ "NYSOSC General Data Document on the NARESPPACC" (PDF). November 4, 2018. ^ "NYS Authorities Budget Office list of NYS Public Authorities". November 4, 2018. ^ a b c Farrell, William E. (1971-02-15). "Albany Mall Reveals the High Price of a Renaissance". New York Times. New York, New York: New York Times Co. p. 44. ^ a b Benjamin, Gerald; Hurd, T. Norman, eds. (1984). "The Builder". Rockefeller in Retrospect: The Governor's New York Legacy. Albany, N.Y.: Nelson A. Rockefeller Institute of Govt. p. 90. ISBN 0-914341-01-4. OCLC 11770290. In a deeper sense, art and architecture have a much more intimate relationship. For him, art and architecture often blurred, and there is no doubt that on one plane of consciousness, Rockefeller perceived the outer shell of buildings as sculpture. The Mall here in Albany, for instance, can be characterized as a group of forms on a platform – sculpture on a pedestal, if you will. ^ Steen, Ivan D. (1986). "The Corning Legacy". In Roberts, Ann F.; VanDyk, Judith A. (eds.). Experiencing Albany: perspectives on a grand city's past. Albany, N.Y.: Nelson A. Rockefeller Institute of Government/State University of New York. p. 81. ISBN 0-914341-04-9. OCLC 21041861. ^ Benjamin, Gerald; Hurd, T. Norman, eds. (1984). "Nelson Rockefeller and the New York Governorship". Rockefeller in Retrospect: The Governor's New York Legacy. Albany, N.Y.: Nelson A. Rockefeller Institute of Govt. p. 297. ISBN 0-914341-01-4. OCLC 11770290. ^ Empire State Plaza at 50, NY State Office of General Services, accessed 20 June 2015. ^ Matthews, Joe (29 September 1997). "Rockefeller's big dream realized". The Baltimore Sun. Retrieved 28 February 2014. ^ "Welcome to the Empire State Plaza". Office of General Services. New York State Office of General Services. Retrieved 2014-05-27. ^ a b "Who lived in the neighborhood knocked down for the Empire State Plaza?". Retrieved 2016-06-24. ^ Albany, 98 Acres in (2014-12-08). "Sleeping, Drinking, and Dying at the Palombi Hotel". 98 Acres in Albany. Retrieved 2016-06-24. ^ Albany, 98 Acres in (2015-04-17). "Three Days before Christmas". 98 Acres in Albany. Retrieved 2016-06-24. ^ Albany, 98 Acres in (2014-11-30). "Sarah Stapleton vs. the State of New York". 98 Acres in Albany. Retrieved 2016-06-24. ^ Albany, 98 Acres in (2014-10-13). "The First St. Sophia". 98 Acres in Albany. Retrieved 2016-06-24. ^ Albany, 98 Acres in (2014-11-13). "St. Paul's Episcopal Church and Its Changing Neighborhood". 98 Acres in Albany. Retrieved 2016-06-24. ^ "Wilborn Temple COGIC - To Know Christ...and to Make Him Known - Memory Lane". www.wilborntemple.com. Retrieved 2016-06-24. ^ a b c d e f Fickies, Robert H. "Building Stones of the Empire State Plaza: A Walking Tour" (PDF). New York State Museum. New York State Geological Survey. Archived from the original (PDF) on 2012-04-11. Retrieved 2015-02-17. ^ Bender, Matthew (1993). Albany Architecture: A Guide to the City. Mount Ida Press. p. 81. ISBN 9780962536816. Retrieved 1 November 2017. ^ "Visitor Center". Office of General Services. New York State Office of General Services. Retrieved 2014-05-27. ^ a b c Riley, Kim (2017-06-02). "Benefits-versus-politics battle rages over U.S. Northeast's natural gas needs". Daily Energy Insider. Retrieved 2017-06-05. ^ England, ISO New. "What We Do". www.iso-ne.com. Retrieved 2017-06-05. ^ "Empire State Plaza Art Collection". New York State. Retrieved 31 October 2018. ^ "Empire State Plaza Art Collection". Office of General Services. New York State Office of General Services. Retrieved 2014-05-27. ^ "Empire State Plaza Art Collection". Visiting the Empire State Plaza. New York State Office of General Services. Retrieved 1 June 2013. ^ a b c d e f Anderson, Dennis R.; Lowry, Glenn D. (2002). The Governor Nelson A. Rockefeller Empire State Plaza Art Collection and Plaza Memorials (1st ed.). New York: Rizzoli Internat. Publ. ISBN 978-0847824557. ^ "Empire State Plaza Art Collection". cumuseum.com. Retrieved 5 November 2018. ^ "Empire State Plaza - In The Heart Of Albany". albany.com Guide to the Capital Region. Mannix Marketing, Inc. Retrieved 2014-05-27. ^ "Memorials on the Empire State Plaza". Visiting the Empire State Plaza. New York State Office of General Services. Retrieved 1 June 2013. ^ "A Self-Guide" (PDF). Memorials on the Empire State Plaza: A Self-Guide. New York State Office of General Services. Retrieved 1 June 2013. ^ "Corning Tower Observation Deck". Office of General Services. New York State Office of General Services. Retrieved 2014-05-27. ^ Goldberger, Paul (July 2, 1976). "Mall Architecture: Futuristic Doesn't Work". New York Times. Retrieved 2015-02-17. ^ Goldberger, Paul. "Mall Architecture: Futuristic Doesn't Work". Albany Notebook. Retrieved 2015-02-17. ^ Hughes, Robert (1980). The Shock of the New: Art and the Century of Change. London: Thames & Hudson. ISBN 0-500-27582-3. Anderson, Dennis R.; Lowry, Glenn D. (2002). The Governor Nelson A. Rockefeller Empire State Plaza Art Collection and Plaza Memorials (1st ed.). New York: Rizzoli Internat. Publ. ISBN 978-0847824557. Roseberry, C.R. (2014). Capitol Story (3rd ed.). Albany, New York: Albany Institute of History and Art. p. 207. ISBN 978-1438456393. Sandler, Irving (1987). The Empire State collection : art for the public. New York: Empire State Plaza Art Commission in association with H.N. Abrams. ISBN 978-0810908840. Wikimedia Commons has media related to Empire State Plaza. This page was last edited on 14 April 2019, at 15:02 (UTC).